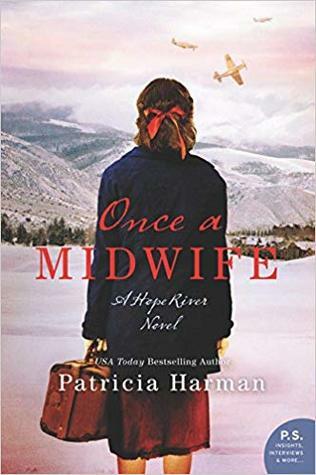 Goodreads: The women of Hope River trust midwife Patience Hester, whose skill in delivering babies is known for miles around. But though the Great Depression is behind them, troubles are not, for Europe is at war…and it can only be a matter of time before the U.S. enters the fray. Kritters Thoughts: The third in a series and this is one of those series where you should start at the beginning, so I may say some spoilers below, so warning you now! Patience Hester is a midwife in a small community in West Virginia and as World War II is looming she is trying to help her community in any way she can. Patience is married to a veterinarian, Daniel, and although they are mostly in the same work field they feel completely different about this war. Daniel still has visions of World War I and they haunt him, so he can't imagine joining the draft and going to war again. This book is about their views on World War II and how their family survives this moment in time. I read A LOT of World War II books and have read a lot here recently. When pitched this book I had no idea that it would be about World War II, but didn't care because I love Patience and following her as a midwife to this community. I was thanking the author for presenting a new view of World War II and how this war affected small communities in the US. Not too spoil too much, but Daniel as a draft dodger was something I had never read before and I loved how his decisions affected his family and neighbors and friends. To see his community both side with him and fight him on this decision was so interesting. I don't know that I had read a book with someone who tried to avoid the draft and I felt myself in Patience shoes as she wanted to support her husband but also supported the reasoning for this war. I hope that there is more to come with Patience Hester. I love her story and her viewpoint and could read more and more about her and her family. Disclosure of Material Connection: I received one copy of this book free of charge from TLC Book Tours and JKS Communications. I was not required to write a positive review in exchange for receipt of the book; rather, the opinions expressed in this review are my own.